The contributions of our alumni and friends are an integral part of the Faculty’s vision and have enabled us to further enrich the positive impact we deliver to our community. In 2018, over 500 dedicated alumni and friends have supported the Faculty of Business and Economics through the donation of their time, philanthropic gifts and expertise, including participation in mentoring and internship programs, membership on alumni committees and Boards, volunteering as speakers at student and alumni events, and volunteering to enrich teaching, learning and research. 350 scholarships and prizes were delivered to students, providing financial relief and important opportunities to expand their studies globally through programs run by the Faculty and University. Professor Paul Kofman and Lisa Li. Dean of the Faculty, Professor Paul Kofman,hosts an annual Thank You Event to reflect on the past year and acknowledge the supporters who are based all over the world. 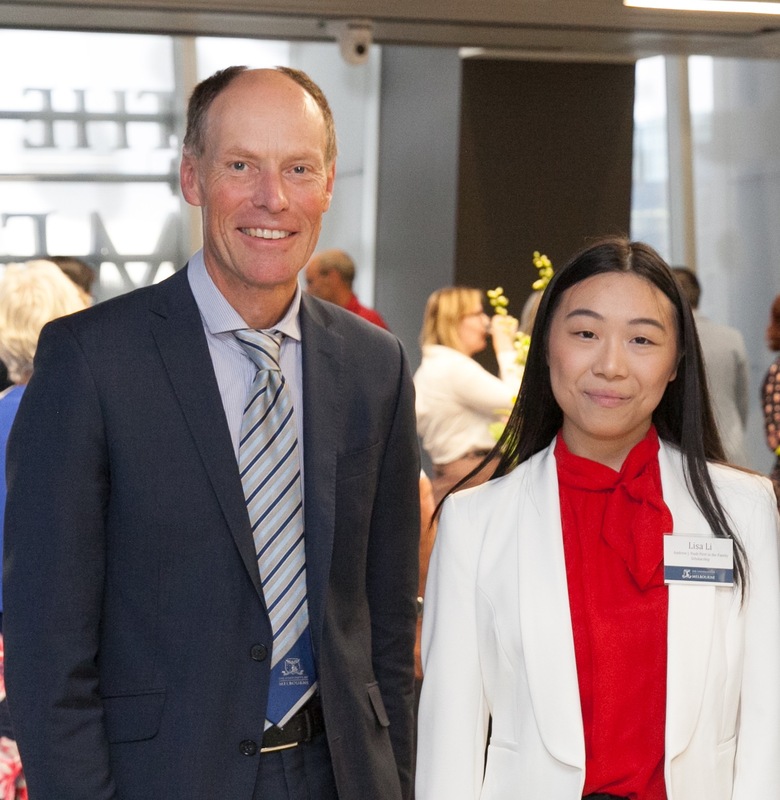 Those that were able to attend this year’s event learned more about the impact of their support and heard the experiences of first year Bachelor of Commerce student, Lisa Li, who is a recipient of the Andrew J Nash First in the Family scholarship. Li is one of the students exposed to the breadth of life-changing opportunities that mentoring, internships, practicums and philanthropic donations provide. "A scholarship is not just about alleviating the financial cost of university, it is the friends you make as being part of a wider group of scholars, it is the events you can attend and the inspirational people you meet. It is the mentor you gain and the support network built to guide you," said Li. It is not just students who benefit from getting involved. From mentoring a soon to be graduate and hosting a student intern, to sharing their career progression and offering expertise to the Faculty through a panel discussion or sitting on a committee or Board, volunteers gain valuable insights and a sense of gratification from their involvement. “Mentoring gives you a chance to explore intergenerational gaps and often unknowingly receive reverse mentoring from your mentee… All in all, it was a really rewarding experience for me," said Career Mentor, Maurice Cheong. The Faculty looks forward to working with our supporters again in 2019 and would like to extend a heartfelt thank you to everyone who has contributed in 2018 and made a real impact on the lives of so many.